An air compressor, by itself, is not a tool you can use to get your DIY projects done. But you may agree that it is difficult sometimes to work without it because so many air tools in your garage rely on an air compressor. Many tools such as orbital sanders, socket wrenches, or brad nailers can all be powered by compressed air. It is no doubt that a compressor is one of the most useful and valuable equipment in your garage. However, when it comes to choosing the best air compressor, shopping can be a tricky part. Whether you are a newbie or a bona fide Do-It-Yourselfer, it can be difficult because of the various brands and models available on the market. You probably will start with many questions before deciding to buy an air compressor. Choosing the right one not only help you to save money, but also open up to a lot of possibilities for your work. Now! Are you eager to find out more about the best air compressor for your garage? If so, here it comes your perfect answer! There two major types of air compressor including stationary and portable air compressors. Their difference lays on the designs and storage tank they carry. Stationary air compressors are usually large devices with big storage tanks to give you more extended periods of use. They are designed for indoor use and typically have a vertical shape to reduce the occupied space. Portable air compressor, on the contrary, has smaller storage tanks and the design usually has handles or wheels to move around easily. They are more convenient and mobile than stationary types and come in many styles. Every piece of machinery contains technical specifications, so does an air compressor. You don’t have to be a genius to understand all this knowledge. Trust me! It’s not rocket science. All you need to do is to spend a bit of time reading these explanations, and then you are all set. Air pressure in a compressor is measure by PSI (Pounds per square inch), which is generated by the horsepower (HP). The amount of air stored in the tank depends on the air pressure. Usually, a higher HP creates a greater pressure and allows you for more longer use time of your tools. Cubic feet per minute (CFM) and standard cubic feet per minute (SCFM) indicate the volume of air delivered at specific PSI levels. The CFM value changes when PSI changes. When you decrease the PSI output, CFM increases. A compressor with a higher CFM rating can provide more air. Therefore, it is better suited for heavy-duty operation such as air wrenches and framing nail guns. Powering air tools is sure the reason why you want to buy an air compressor. However, it is good to know that every air tool has specific requirements that a compressor must follow. It means before you decide to buy an air compressor, firstly, think of the tools you want to use at the moment and those you might need later. Next, try to find out the highest PSI, and the highest CFM, then you add 40 – 50% to the required CFM for the sake of your safety. Finally, you can start looking for a compressor that meets those requirements. Adjustable exhaust port helps you to direct exhaust away from the site. It is one of my favorite features. Multiple couplers make your work more flexible, allowing you to do tasks simultaneously with various tools. This machine will be fantastic for your garage. The California Air Tools 8010 can satisfy you from light to medium jobs around your garage or home. What I like about this air compressor is that it runs very quiet. It produces only 60 decibels of sound, one of the quietest air compressors on the market. The CAT-8010 Air Compressor has an Oil-Free Dual Piston pump with a life cycle of more than 3000 Plus hours. The Pump System is engineered to deliver high performance and durability. The Oil-Free pump is rather versatile as it can work well in many different temperatures and rough terrains. Additionally, the air tank weights only 54 lbs and the wheel kit allows you to move it around freely. If you often work indoor and noise is a major issue, this one is ideal for you. The California Air Tools Cat – 1P1060SP is a very light and quiet air compressor. The whole unit can be carried around easily because its steel air tank weighs only 34 lbs. This equipment operates at 56 decibels of sound, making it one of the quietest air compressors on the market. The California Air Tools Cat has an oil-free single Piston pump that is designed to have a long life cycle of over 3000 hours. On top of that, the 0.6 HP motor runs only at 1680 round per minute, allowing the compressor to create less noise and become more durable. With the new updates, the oil-free pump allows it to work well in a variety of different temperatures. The California Air Tools Cat produces 1.2 CFM at 90 PSI which makes it compatible with staple guns, brad nail guns, finish nail guns, airbrushes, and blowguns. This air compressor is quite ideal for working indoor because of its low-noise feature. This pancake air compressor only weighs 34 lbs and is highly portable. The machine has a pancake style, rubber feet, and a water drain valve. The Porter-Cable C2002 Oil-Free Pancake Compressor has a 150 PSI max pressure and features a 2.6 SCFM at 90 PSI for quick recovering time. This compressor brings optimal performance, including an oil-free pump system that requires no maintenance. Thanks to its low AMP, 120-volt motor, it can start and work well in cold weather conditions. One of the great things about this piece of equipment is that you don’t have to worry about wasting time in cleaning oil spills or maintenance due to the user-friendly design. The rubber feet also allow you to carry it around inside your house without a scratch on your floor. This air compressor is excellent for any jobs from shooting nailers to filling tires. The Bostitch BTFP02012 Oil-Free compressor features a long-life while being oil-free and maintenance-free, saving you a lot of time. The pump system can deliver 2.6 SCFM* at 90 SPI for a longer run time but quick recovery. One of the facts that interests me is that it only weighs 29 lbs, quite light for a compressor. With two built-in universal couplers, it can support two users easily at the same time. Besides, the compressor comes with a BOSTITCH high-efficiency motor which allows it to start in cold weather condition easily. I had used this compressor in my project to shoot over 1,000 nails, and it ran flawlessly. And even better! I was surprised that it took only around 3 minutes to reach 150 PSI. The design is friendly and ergonomic, especially when your work requires you to move around the site. All feet are covered with rubber to make sure there won’t be any scratch on your floor. 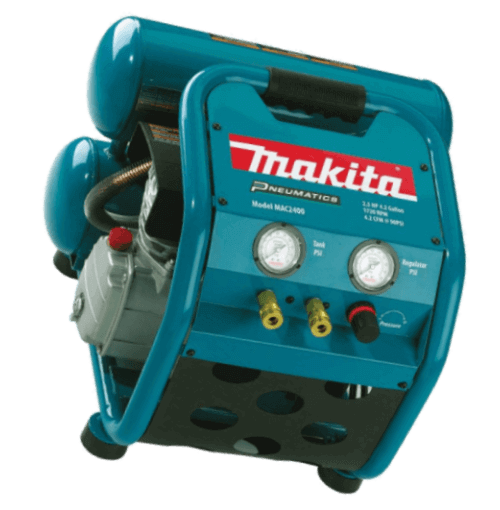 The Makita’s 2.5HP Air Compressor has a Big Bore engineered pump cylinder and piston to provide higher performance for two outputs. The pump system also allows the air compressor to work at its lowest level of noise but still ensure the performance for a job. One of the unique features of the MAC2400 is that the pump has a cast iron cylinder. It increases compression and durability for demanding jobs. Its oil-lubricated pump is equipped with a large industrial filter for more air intake and efficiency. The oil lubricated also allows the pump to run cooler and prolongs the life cycle. For motor protection, the MAC2400 has a built-in thermal overload. The compressor has two air tanks with a capacity of 4.2 gallons to support an operating pressure of 130 PSI, enough for two nailers running simultaneously. Additional features include a lever handle ball valve and a tank drain valve for easy maintenance. And lastly, the design provides a roll bar handle for portability and mobility. This California Air Tool with a twin air tank is perfect for any jobs from professional to general household chores. Like other models from California Air Tools, this compressor offers low noise during operation. The two horsepower motors are engineered to increase the life cycle and provide a longer time of use. They only run at 1680 round per minute to create less noise and less wear, but still, ensure high job performance. Many users say that it has no problem starting up in cold weather. Another feature includes an Easy Start Valve that helps to release a small volume of air and enables the motor to spin freely. And the best part is that this compressor is very portable and lightweight. You can carry it around without effort. The Porter-Cable CMB15 is one of the lightest compressors on the market with only 20 lbs of weight, making it portable for your garage. It is such an ideal piece of equipment for job sites that require mobility. The design is unique with its 1.5-gallon air tank fully shrouded inside the grey cover. A water drain valve and rubber feet are attached to the unit to add more convenience for use. The tank pressure can reach at its max 150 PSI and allow more air intake for longer run time. The Porter-Cable CMB15 has a very durable oil-free pump, which increases the life-cycle and reduces maintenance. The motor also runs at very low AMP, only 120V, and starts up quickly in cold weather conditions. People like this compressor not only for the cool design but also for its quiet operation. Coming with only 20 lbs of weight, it can be hand-carried easily around the working site. The durability and portability will satisfy your demand if you are searching for something small and mobile for your household projects. The direct drive motor only needs around 4 AMP at 115V to start up and can deliver the 120 PSI maximum output. The air tank is capable of carrying 1-gallon air and has individual gauges to regulate air pressure. Despite its small size, this compressor can easily handle any tasks from inflating to nailing effortlessly, so don’t judge it by its cover! If you are looking for a small but powerful air compressor for your garage, this SENCO PC1010 is worth your consideration. I’ve had one a few years before, and I am still using it now. This 2-gallon air compressor is simple and powerful. The whole unit comes with a 280C sealed air tank mounted below. It can deliver a maximum pressure at 150 PSI. I was surprised that it only takes around 60 seconds to fill up the tank. It can handle amazingly any jobs from simple craft works to professional projects, and also is very portable because of its lightweight. Another feature is a replaceable air filter for running in harsh environmental conditions. This filter can keep dust or sand from entering and damaging your machine. Even though other brands such as Makita, California Air Tools or Bostitch get a lot of attention, this Viair 150 PSI Air Source Kit still proves itself as one of the best products on the market. If you are looking for a portable and compact compressor for your garage, you should give it a shot. Simply put, I find this piece of equipment excellent for the price. Sure, you probably can find some other cheap alternatives, but in the long run, this well-built and good quality compressor will still be in the game. This compressor is designed to give more for the buck. Having two stack tanks which can hold up to 4.6 gallons, the whole unit weighs just only 38 lbs. The design is also very ergonomic with rubber handler for carrying around the job site easily. The dual piston pump system has higher durability and performance: 25% more of compressed air compared to similar models. The compressor is engineered to perform at its best, and it can compress air up to 125 PSI. Besides, its oil-free pump is durable and maintenance-free to provide a longer time of use. I would say that this Campbell Hausfeld can handle just anything from simple crafts to big projects. Continuing to stay in the game and upholding its reputation for the best quality, this Dewalt Pancake Compressor can satisfy anyone from homeowners to contractors. This well-built and high-quality machine runs with a high-efficiency motor, which makes it easy to start in cold weather. The pump system is engineered to provide higher performance and reduce wear. It also compresses air at 165 PSI and delivers 2.6 SCFM at 90 PSI, and 3.7 SCFM at 40 PSI. I first bought this air compressor a few years back and usually used it for car repair, upholstery, and some personal projects. I was satisfied with its performance. Whether used for inflating air or shooting nails, the Dewalt Pancake Compressor proves that size doesn’t matter. It can power plenty of air tools and handle multiple tasks with no issues. And if you are worried about the loud noise it may cause, you would love to hear that this compressor only runs at a noise level of 75.5 decibels, suitable for quiet work and indoor environment. An air compressor is an indispensable item for homeowners or contractors. The number of applications that we can use a compressor makes it become the most versatile and valuable tool in the garage. From inflating tires, firing nails, blowing leaves from your garage floor to powering hammers, wrenches, saws or spray, life is so much easier, and work is done so much faster than ever with the help of this equipment. We understand that shopping can be a little difficult, especially when there are too many offers available out there, which make you confused. But we hope to provide practical information and solutions so that you can choose the best air compressor for your garage. Do you think this article is useful and have answers to your questions? Share it to your friends or colleagues, who are maybe looking for an air compressor for themselves.